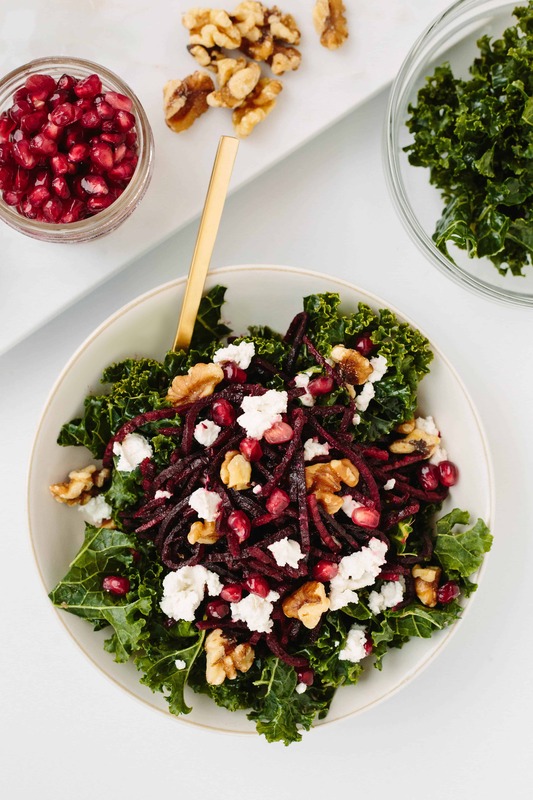 Meet the winter kale bowl: a bowl of massaged kale with festive, seasonal toppings like roasted spiralized beets, goat cheese, walnuts, and pomegranates. It’s festive, it’s easy to make, full of nutrients, and frankly, looks like a bowl of Christmas with the red and green. 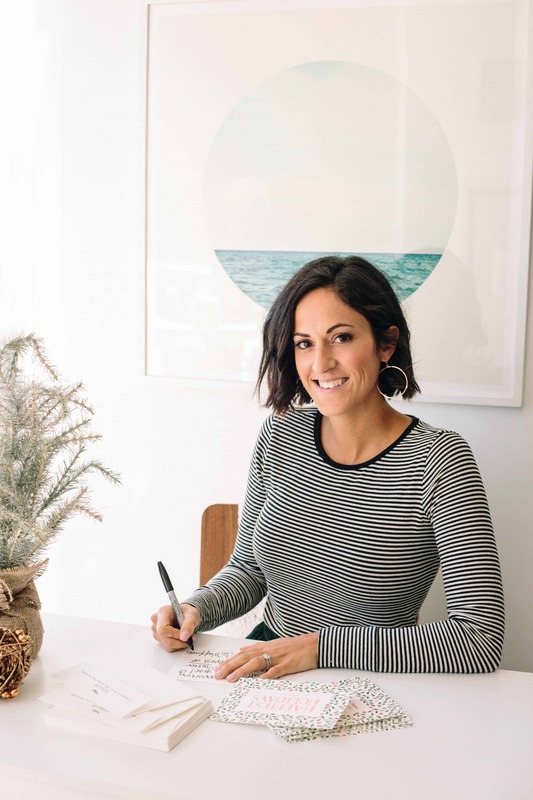 Speaking of the holidays, today, I’m sharing our holiday cards – and my Inspiralized holiday cards, thanks to Minted. Before I get to my adorable holiday cards, let’s talk about this festive bowl. The beet noodles pair perfectly with the goat cheese and walnuts – it’s like a cheese platter! The pomegranates give the dish an extra pop of sweetness and adds color and texture to the dish. 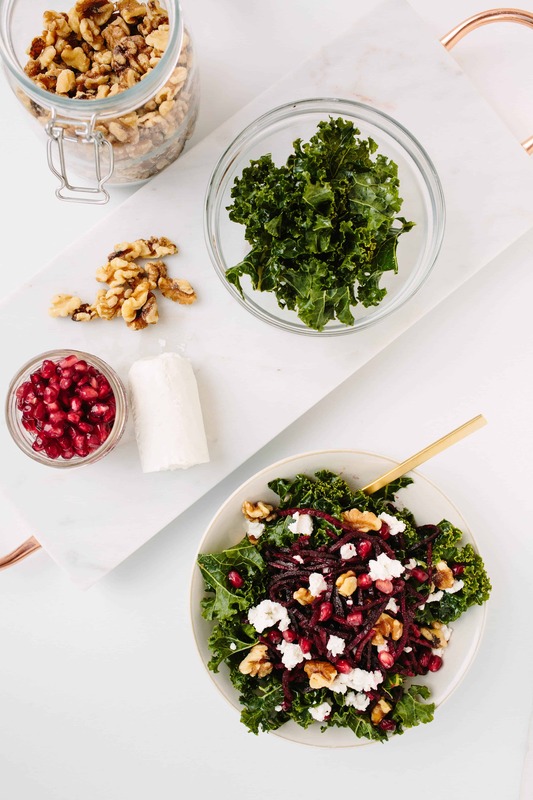 This kale bowl can be customized to your liking – try adding different variations of spiralized veggies and toppings to make it your own! For example, don’t want to messy yourself with spiralizing beets? Use parsnips instead! Don’t like goat cheese? Try feta! Leafy greens, root veggies, velvety smooth cheese, and crunchy walnuts – this bowl will satisfy your tastebuds, fill your tummy, and leave you nourished! I love holiday cards, and I’m excited to share mine with you today! 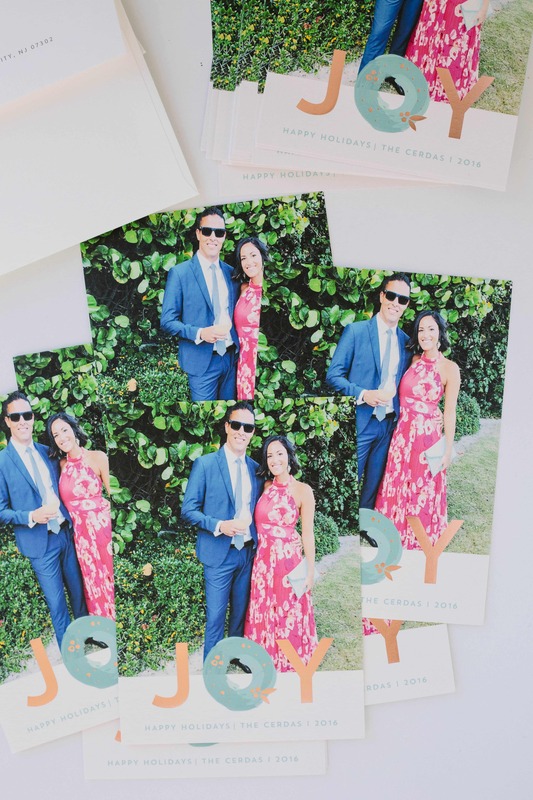 I’ve been using Minted for a while – I used them for a lot of my wedding stationary (for example, our Save The Dates) and I used them for last year’s holiday cards. 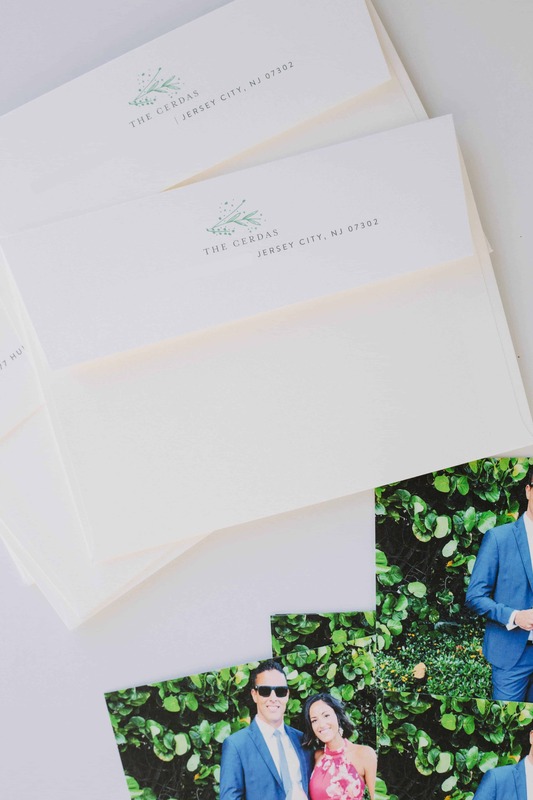 They have the best designs, their customer service is amazing, and they offer time saving features like the Address Assistant, which lets you type in the addresses of the people you’re sending the card to and prints them on the envelopes. You can even customize your own stamps with little pictures of your family! I was totally the girl who couldn’t wait to get married so that she could send out holiday cards each year of the family. When the holiday season came around last year (we got married last year), I was extra excited to be married – so that I could finally send out holiday cards. Last year, we used our wedding photos, but this year, I decided to simply take a photo from one of the major events of the year that showed us together, enjoying our time together. I thought about paying for a photoshoot to get some professional photos, but then I thought, “What does that show?” It would be a staged photo! Instead, I chose this photo of us from a wedding we went to this year in Anguilla. We have big smiles on our faces, because one of our closest friends got married. Hopefully it radiates through the card! This is the exact JOY card template we chose – it’s foil-pressed in rose gold! I also got holiday cards as a business owner for Inspiralized. 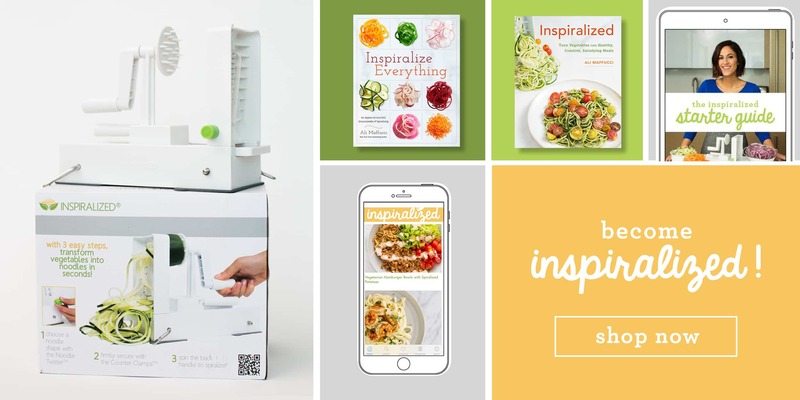 I work with so many people each year, and I value their support of Inspiralized so much (without them my brand couldn’t grow! ), so I love sending hand-written notes to the people I’ve built working relationships with over the year/years. I wanted something simple and cheery, so I went with a simple Happy Holidays card with the word “Inspiralized” written on the front. I can’t wait to send all of my cards out this year! Preheat the oven to 425 degrees. Line a baking sheet with parchment paper and lay out the beet noodles. Drizzle with 2 teaspoons of the olive oil and season with salt and pepper. Massage the oil into the beet noodles. Roast for 6-8 minutes or longer, if you want a softer noodle. Meanwhile, prepare the kale. In a large mixing bowl, add the remaining olive oil, apple cider vinegar, honey, salt, and pepper. Whisk together. Add in the kale and using your hands or tongs, massage the kale for 30 seconds to 1 minute to soften up. 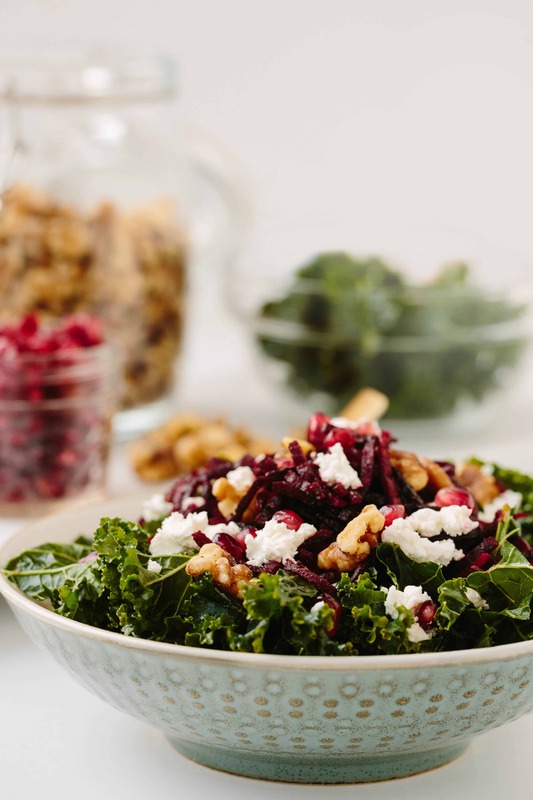 Once the beet noodles are done roasting, build your bowls: divide the kale into two bowls. Top with the beet noodles, goat cheese, walnuts, and pomegranates. Serve. Love this colorful variation, with its addition of pomegranate seeds and a few other tweaks, of what is one of my favorite Inspiralized recipes. I don't see the nutritional information, though, except for Weight Watcher points. Did I miss it? At the bottom, in the Notes? 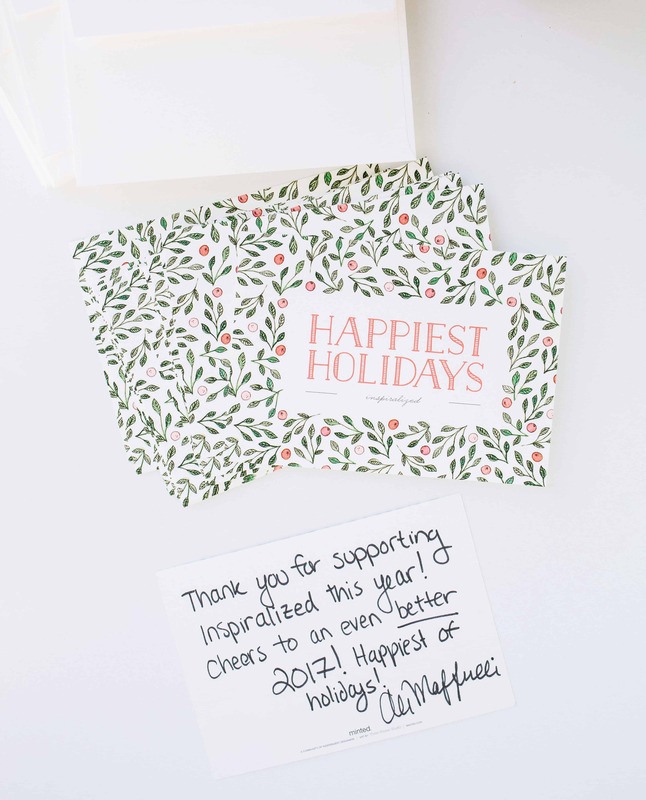 I love your holiday business cards, so cute and classy! I also love this recipe, but also that you include other combinations to try! Happiest holidays! I made this salad tonight to go with our dinner and my children absolutely loved it! They were very skeptical at first, but one by one they all tried it and trusted the reviews of each other until everyone had a heaping helping on their plates. Thank you for the great recipe! I switched out the apple cider vinegar for some mango vinegar I had picked up in France but had yet to try out. It was delicious! Thanks again! This salad is delicious! We used a golden beet, added juice of a small lime, and sliced a strawberry on top of each salad. Yum!